Scisnack | Event: Where the Science Story Burns! 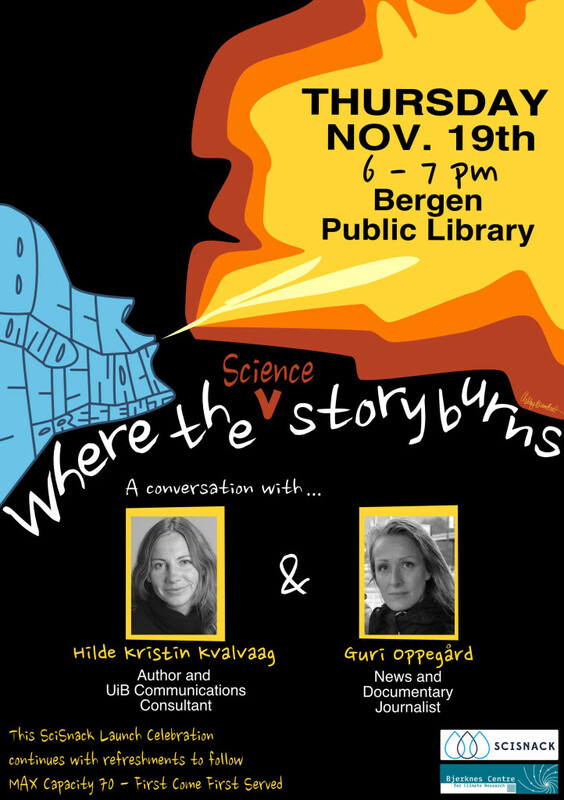 Event: Where the Science Story Burns! Do you know where your science story burns to engage your target audience? Did you know that Science and Storytelling have something in common? As scientists we get paid to do research. But we also get paid to talk about our research. Let’s get inspired from Storytellers Hilde Kvalvaag, author and communications consultant, and Guri Oppegård Gunnes, documentary and news journalist (and previous editor at På Høyden), whose jobs are to tell stories! Come and join our conversation! We’ll hear about the stories that they tell and how they find the story that BURNS! We’ll find out what their audience want to hear and how they refine their stories accordingly. We’ll discuss how we might be able to transfer these storytelling skills to our own science communication. This communication might be everything from general outreach to our technical scientific articles. After we chat with Hilde and Guri, the SciSnack Launch Celebration continues with refreshments in the Library Café. MAX Capacity 70 – First Come First Served. Let us know if you intend to come here.